Aristotle’s Doctrine of the Mean states that many things turn out best when practiced with moderation and with balance. Unfortunately this has been over-expanded over time to “All things in moderation,” but most would agree that even a moderate amount of heroin is not likely to turn out well for you in the long term. 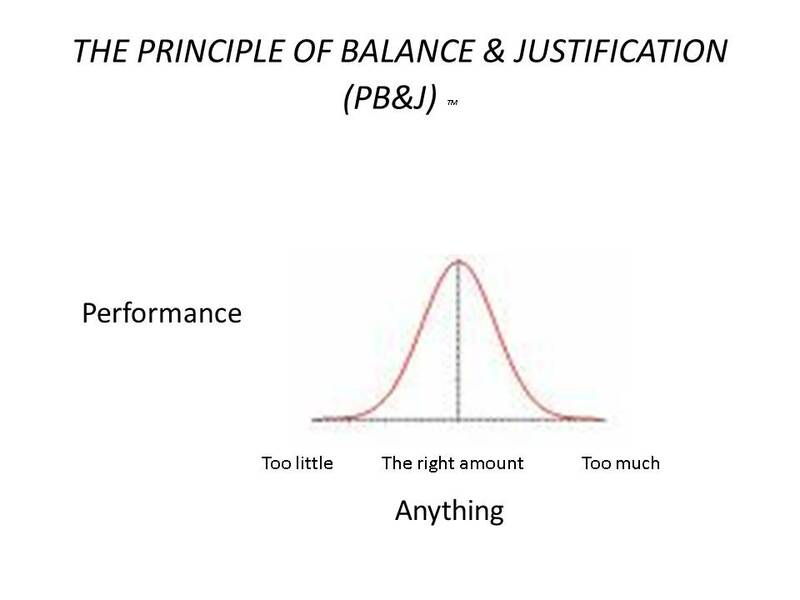 Seems like it would be more fun and easier to remember to call this maxim something like “The Principle of Balance & Justification (PB&J–peanut butter & jelly),” so let’s do that. With our caveats in place, here are some business processes that lead to the best financial results when practiced with moderation and balance. Imagine the middle portion at the top of a bell-shaped curve where you get the best performance on whatever you’re measuring. Compensation. Too little: under market value (can’t hire A Players), not based on performance (can’t retain A Players). Too much: too far over market value (unnecessary overhead, attracts “terrorists” with the wrong core values). Management. Too little: lots of ambiguity, lack of focused goals and measures, no clear accountability (what are we doing and who’s accountable?). Too much: over controlling micro-management (why bother thinking for myself? can’t retain A Players). Planning. Too little: constant day-to-day firefighting (the urgent crowds out the important actions needed for greater success). Too much: too many long meetings (analysis paralysis, lack of nimble execution in the marketplace). In these business processes as well as many others, pursuing the moderate and balanced approach yields the best sustainable organizational performance and financial results. When’s the last time you really got to enjoy your PB&J like this? Err in the direction of moderation and balance in your business decisions. Bracket important decisions with best case/worst case or too little/too much anchors and brainstorming to find the ideal balance and action plan. Leaders who are successful over the long term tend to take moderate risks rather than no risk or swinging for the fence.